This entry was posted on Sunday, 21 February 2010 9:43 at 09:43	and is filed under Iraq's 2010 parliamentary election, Iraqi constitutional issues, Sectarian master narrative, US policy in Iraq: Leverage issues. You can follow any responses to this entry through the RSS 2.0 feed. Both comments and pings are currently closed. There are some 6,172 candidates. There are 18.9 million registered voters. There are 300,000 poll station workers. There are 50,000 polling stations spread over 9,000 polling centers…. But there are 26 voting Form!!! So why these voting forms printed in this number should be match the voter number with small number of voting formes spare? or its ready for rigging? What’s interesting is that I have only seen one coalition take the issue of a manifesto seriously – that of Maliki’s State of Law Coalition. I can’t find any other coalition, including Allaw’s, that has anything similar. It makes me question how serious they are about bringing about change and undoing mistakes of the past. A centrist government that incorporates aspects of national reconciliation is of course more preferable for longer-term stability than a government controlled by “rapacious regional forces”. But the best-case, in the short term, that we may be able to hope for is simply an election that Iraqis see as legitimate. With regard to that more near-term goal, what about, as you say, “…what will follow if the elections are fraudulent.”? More specifically, what is your impression of how likely it is that there will be a significant complaint or complaints (on the scale of the recent Afghan national elections) that would deem the elections “fraudulent”? In your mind, how would you see a scenario like that playing out? But above all I would have preferred a debate where parties moved beyond this highly predictable A-Z of Iraqi society (unsurprisingly, they are all against corruption and in favour of the environment!) towards focusing on the real sensitive issues, like how to deal with the oil sector, what to do with Kirkuk, how to revise the constitution and so on (where State of Law, too, are vague or say nothing at all). I suspect they are all silent on this for fear of alienating prospective government partners. Joe, always the realist… No, I don’t foresee revolution or a return to 2006 or anything on that scale. 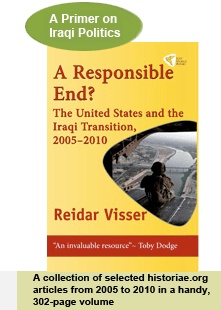 After all, the government of Iraq has been assisted in building up a quite effective apparatus of repression over the past two years and can employ it against internal enemies if necessary. Rather I envisage a gradual transition to Iranian dominance, maybe so slow that Washington will not discover what is going on or at least experience the whole thing as relatively painless until we one day have two closely aligned governments in Baghdad and Tehran in control of oil reserves that equal those of Saudi Arabia. Also, unless there is a Peter Galbraith equivalent on the loose somewhere in Baghdad then there won’t be an international outcry either (suspicion about the Afghan election result being probably the only thing in this world that I agree with Galbraith about). Galbraith himself is of no use in the Iraqi context, of course, not least given his leitmotif of trying to prove that the governing council of 2003 was in fact a reflection of the Iraqi popular will. Thank you for the response Reidar. I agree, they seem to have avoided the really sensitive issues like Kirkuk and the constitution. However, if you have a read the document, there is a lot more than just simple statements like before. For example, there is what I thought was a novel idea about how to sort out the water problem in Iraq (re:agriculture) – they suggest building dams which catch the higher levels of the rivers during the winters in resevoirs and release them during the summer months. That’s a lot more detail than anything I’ve seen before from any party. It at least shows they are thinking about the future of the country rather than just how to score political points. In an ideal world, they would also tell us what they plan to do about Kirkuk, etc – but I see this as progress. Now if only the other parties, especially the major groups like Allawi’s, Kurds, Bowlani’s can do something similar, we then might have a proper elections debate. Reidar, you giving to much emphasis to political process with special regards to the elections process. Now things are coming and rolling. Here today one guy writing from Australia about setting voting offices /elections offices for Iraqi there, this should be read with attentions that these guys have nothing to lose they can do any things juts to rigging the election be in next “government”. Let me picking your attentions here, Barazani was met Qanim Alshilabi Iraqi ambassador in Austral as last minutes work which very understandable there are biog Kurdish/ and other northern Iraqi group there. Few days ago, an article written by Robert Dreyfuss discussing recent Hill’s talks about Iraq and also Chalabi factor in Iraq, it’s worth reading. Traiq brought here Ayad Jamal Aldin who is very a controversial figure who graduated fro Qum, close friend to Khomeini’s Son Hussein wearing turban but he opposing Iranians interfering in Iraq. In an interview on one of Iraqi satellite stations telling his non-attendance of Iraqi parliament meeting for so long because of sectarian divisions inside the parliament!! …..
You talk about the seriousness of “bringing about change and undoing mistakes of the past” and I could not agree with you more. However, the Dawa Party has been in government for 5 years out of the 7 years in the ‘new Iraq’. The State of Law Coalition candidates include the current Prime Minister and some current 12 ministers. Could you please explain to me where the change will come from? Did Dawa suddenly realise how to solve the country’s problem after 5 years of rule? The Prime Minister is from the Dawa party, but his cabinet, which constitutes 30+ ministers, are divided along ethno-sectarain lines according to the ethno-sectarain quota introduced by Bremer. The PM does not make decisions on his own, but by a vote in the cabinet, so everyone represented in the cabinet shares part of the responsibility for failings. Moreover, and much worse, the PM doesn’t have the right to reshuffle his own cabinet, because the ministers are accountable to their parties and blocs. The change that Dawa and many others want is to deal with ethno-sectarian quotas, and give the PM more freedom and more control over his own cabinet. He should be completely responsible for the performance of the cabinet, and that is only possible if the cabinet is accountable to him. Another thing, a lot of the failures attributed to the government should actually be attributed to the Parliament, where many members of Parliament blocked legislation that the government needed to carry out its work so that Maliki’s government does not succeed.